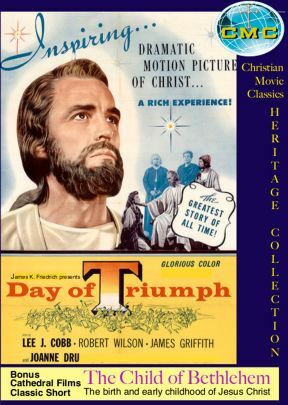 Day of Triumph (1954, color) is a landmark film in cinematic history. As the first life of Jesus since the silent movie era, it allowed audiences to hear Jesus speak on screen for the first time. And in refreshing contrast to the garish biblical spectaculars of its time, it was praised as "a model of simplicity and good taste" (Newsweek). The profound and poignant story of Jesus' life is uniquely reflected through the eyes of the Zealots. Led by Zadok (Lee J. Cobb), the Zealots are plotting to overthrow the Roman rulers and are seeking a leader of great magnetism. Could it be the man Jesus, who is exciting everyone with his miracles and wisdom, and whom the populace is hailing as the Messiah? Judas conspires to have Jesus arrested to furnish the spark that will launch the revolt. But the plan backfires and Jesus is crucified—only to reappear as the risen Christ. The Gospel events which changed the world forever are vividly and faithfully told: the calling of the first disciples, the Sermon on the Mount, the conversion of Mary Magdalene, the raising of Lazarus, the Last Supper, the Crucifixion, and the Resurrection. 110 minutes. Includes The Child of Bethlehem (1941). Jesus' birth and childhood are portrayed according to Matthew and Luke in this Cathedral Films classic. Scenes include Mary and Joseph's journey to Bethlehem, adoration of the shepherds, visit of the Wise Men, Herod's order, flight to Egypt, return to Nazareth, and Jesus' first trip to the temple. 20 minutes.